This month, Remington Group will launch sales at Park Towers Condominiums at IQ – the second phase in the incredibly successful IQ Condominiums neighbourhood in Etobicoke. 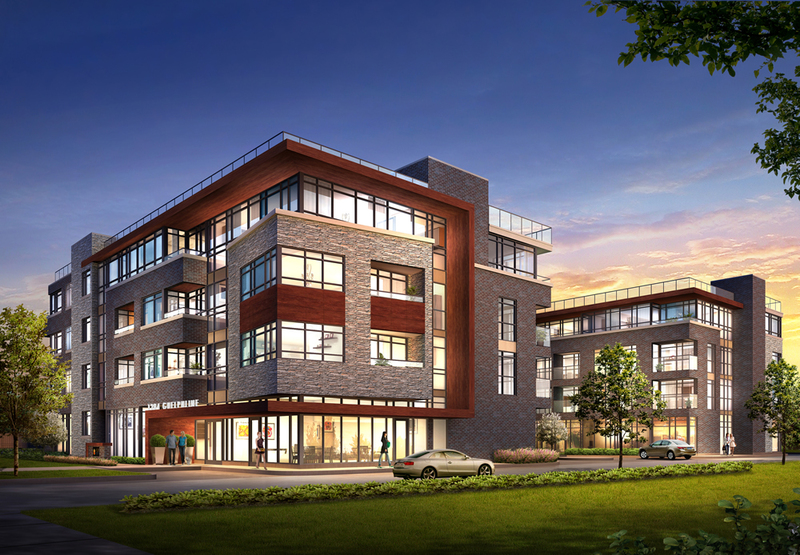 The new residence is part of Remington’s master-planned community at Islington and The Queensway. What a fabulous location, just moments to the waterfront, minutes to downtown Toronto, close to major transit routes and steps to an astounding array of amenities. If you love shopping, one of Toronto’s largest malls, Sherway Gardens, is only a five-minute drive! Park Towers offers another opportunity to live in this urban area overlooking a park designed by renowned landscape architect Janet Rosenberg. The condominium will have a beautiful reception lobby with polished inlaid tiles, seating areas and attentive 24-hour concierge service. Just imagine the phenomenal views from the landscaped rooftop terrace, which is perfect for barbecuing and entertaining. Amenities will extend to an infinity pool and deck lounge overlooking the fabulous park, yoga studio, fitness centre and a gorgeous party room complete with a wet bar and caterer’s kitchen. Choose from studios to two-bedroom + den suite designs. Each features a fresh-air balcony and floor-to-ceiling windows for spectacular views, as well as high-quality features and finishes. Register now for this exceptional condominium created by some of the most brilliant architectural minds and urban thinkers in the city. 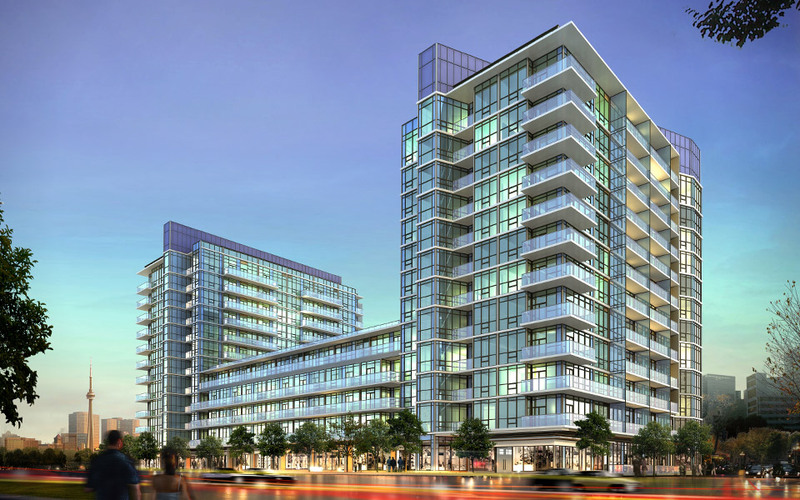 Visit www.iqcondos.com or call 416-253-5838. We all know that when it comes to condominium shopping, it’s about location, location, location – and if your destination of choice is Burlington, have I got great news for you! ADI Development Group will soon launch sales at The Mod’rn Condominium – a gorgeous four-storey residence of glass, stone, natural wood and onyx brick. And are you ready for this? Prices will begin from the mid-$170,000s! The value is incredible. This intimate new condo is situated in the amenity-rich neighbourhood on Guelph Line, just north of the QEW – only minutes from downtown Burlington, Lake Ontario, parks, shopping and GO Train service. Residents will enjoy a wealth of amenities right in their building as well, such as a chic lobby with a double-sided fireplace shared by the party room, plus a rooftop terrace with a fireplace lounge and barbecue facilities. Choose from one-bedroom to two-bedroom suites, all smartly finished with appointments such as 9-foot and 10-foot ceilings. The Mod’rn is brought to you by ADI Development Group, which was founded on three generations of builders who are real estate visionaries. This prestigious firm is dedicated to delivering innovative design and top quality. What an incredible opportunity – register now to be among the first to explore all that The Mod’rn has to offer. Visit www.adidevelopments.com. Since Baker Real Estate Incorporated opened our branch office in Montreal, the response we have had is overwhelming. There is obviously a pent-up demand for condominiums in this beautiful city. 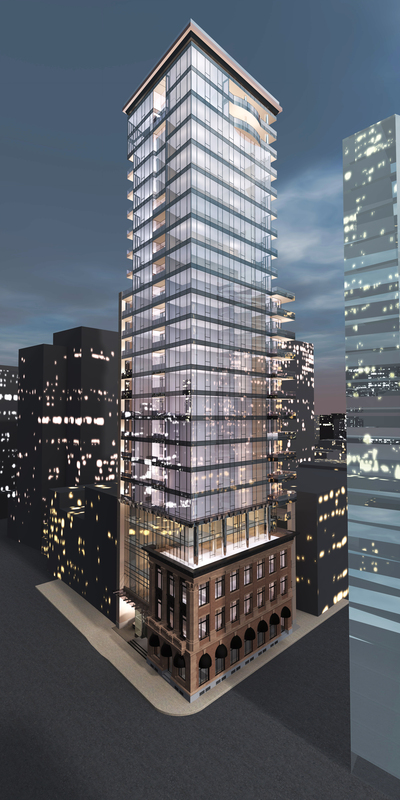 Toronto developer Benvenuto Group is bringing another condo residence to life – Le Peterson. Everyone is excited about its location in the heart of Quartier des Spectacles, Montreal’s entertainment district. Recently, the developer released the Skyline Tower Suites at this condominium, where prices begin from just $214,900. Visitors can also tour a new model suite designed by Bryon Patton and Associates, which is handling interior design for the condominium. Situated between Sherbrooke Street and President Kennedy on de la Concorde, just west of Bleury, Le Peterson is in the midst of an area undergoing renewal to become Montreal’s hub of culture and the arts. The Metro, galleries, theatres, shopping, museums and cinemas are all just steps away. 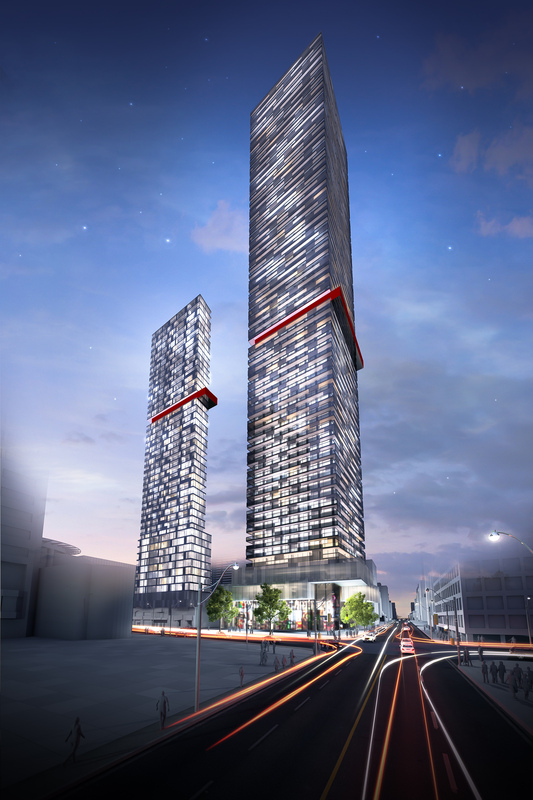 And you simply have to see the rendering of this 31-storey building to understand what an iconic addition it will add to the Montreal skyline. 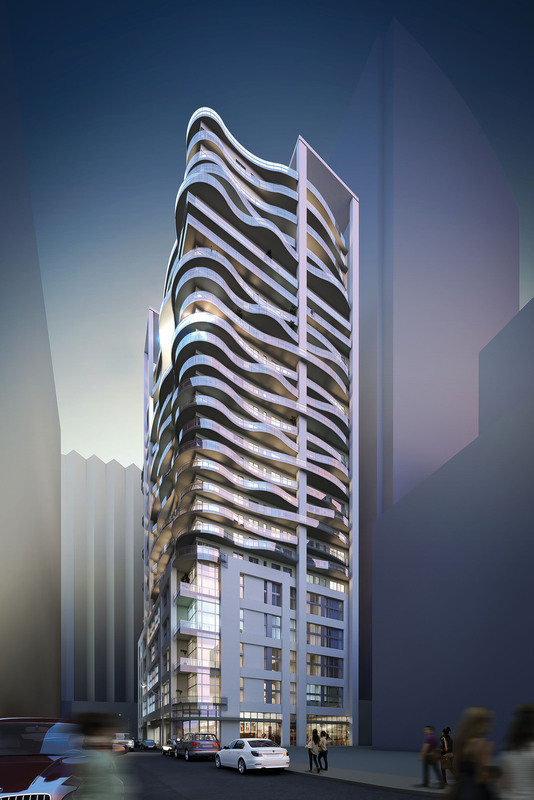 This unique design by Bruno St. Jean of DCYSA features asymmetrical curves and angles cradling suites and lofts that ALL face east, west or south. 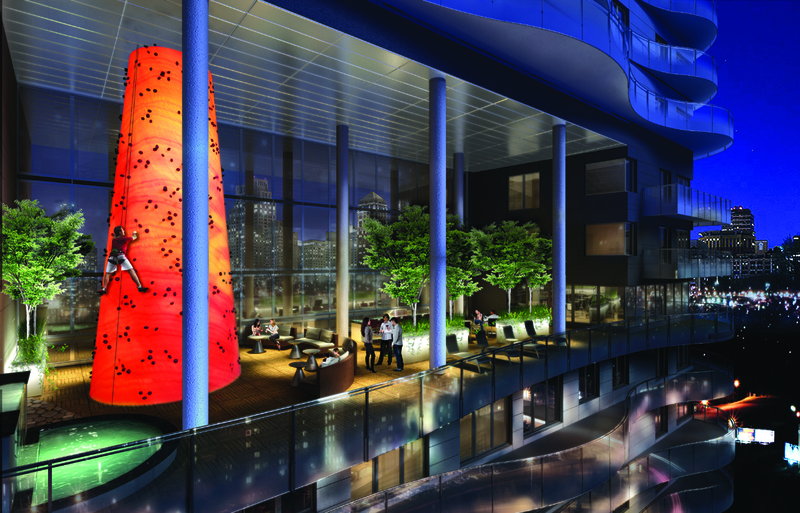 This innovation ensures that all owners will have views of the ever-vibrant Quartier des Spectacles. The lofts have 18-foot ceilings and mezzanine bedrooms for the ultimate in modern living. All the lofts and suites are beautifully appointed. There is literally something for everyone at this fabulous condominium – including amazing opportunities for exercising and socializing. 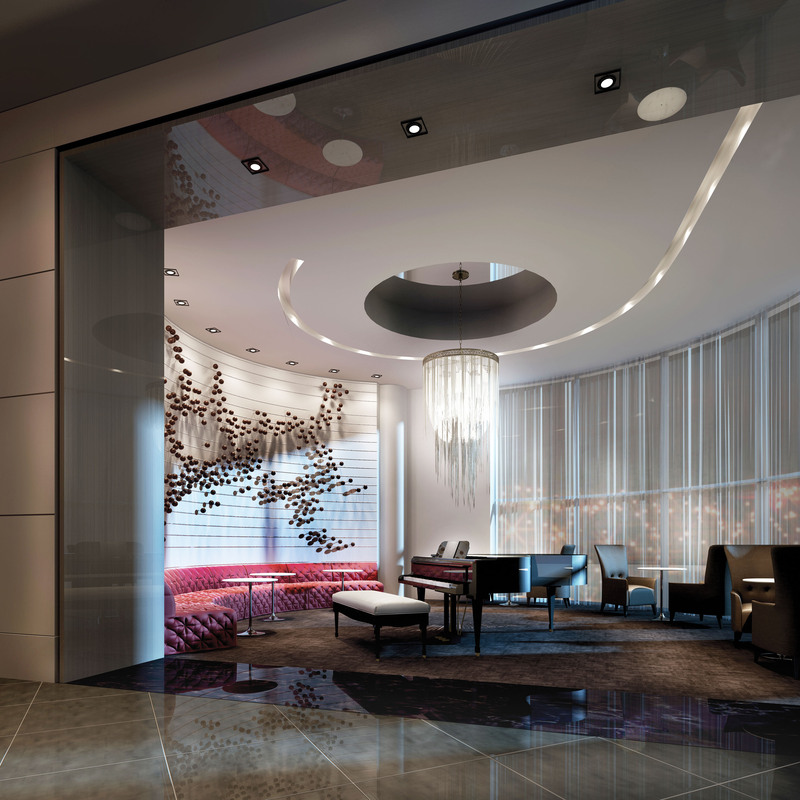 Among the amenities are a two-storey lobby with 24-hour concierge service and a sitting area with a grand piano. Talk about a grand entrance” And there’s more – a lounge, party room, outdoor lounge with barbecues, a three-storey climbing wall, fitness area… it’s incredible. Well-known and respected Toronto luxury condominium developer Benvenuto Group is the sister company to full-service investment property owner Malen Capital Corporation, and both are headed by native Montrealer Mitchell Abrahams. Quality, design and value are paramount in whatever Mr. Abrahams creates, and purchasers recognize this. When Benvenuto Group opened Le Peterson in July, 75 per cent of the 60 lofts released were sold the first day. Now is the time to get in on the ground floor of new home real estate in this coveted section of Montreal. The Sales Office is located at 405 rue de la Concorde, between Sherbrooke and President-Kennedy. Call 514-904-8686 or visit www.lepeterson.com .